'I have used this book in all its editions since first publication with my undergraduate and postgraduate students. It is a core text for all the students, because it provides the detail they require at an academic level. Importantly it is a book for the practitioner to use too.§§This is why we use it on our postgraduate practitioner programmes - where we actually buy the book for the students as we believe it is that important. No other text comes close and literally thousands of our graduates have benefitted from it in their subsequent careers: written by the specialist for the specialist. 'David Edmundson-BirdPrincipal Lecturer in Digital MarketingManchester Metropolitan University Now in its sixth edition, Digital Marketing: Strategy, Implementation and Practice provides comprehensive, practical guidance on how companies can get the most out of digital media and technology to meet their marketing goals. 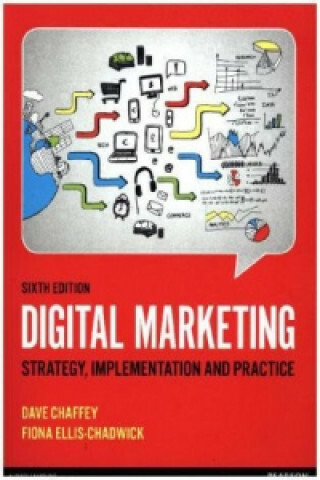 Digital Marketing links marketing theory with practical business experience through case studies and interviews from cutting edge companies such as eBay and Facebook, to help students understand digital marketing in the real world.§§Readers will learn best practice frameworks for developing a digital marketing strategy, plus success factors for key digital marketing techniques including search marketing, conversion optimisation and digital communications using social media including Twitter and Facebook. Dave Chaffey is a digital marketing consultant and publisher of marketing advice site SmartInsights.com. He is a visiting lecturer on marketing courses at Birmingham, Cranfield and Warwick universities and the Institute of Direct Marketing.§§Fiona Ellis-Chadwick is a Senior Lecturer in Marketing at the Loughborough University School of Business and Economics, Director of the Institute of Research Application and Consultancy at Loughborough University, academic marketing consultant and author.